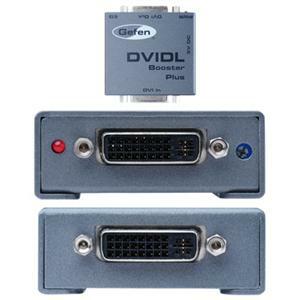 Like our DVI DL Booster, the new DVI DL Booster Plus allows the extension of massive desktop resolutions over dual-link digital video cable well beyond its default limit of a 15-foot distance. Without such a device, sparkles or other objectionable mutations of the video signal can appear. Such degradations are completely unacceptable, especially where computer applications are concerned, where desktop images must be sharp, clear and bright for productive work to take place.